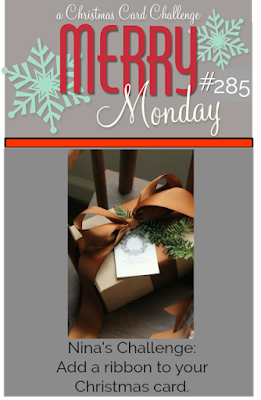 Good Morning - we have a new Merry Monday Christmas card challenge, I am the hostess this week and my challenge is to Add ribbon to your Christmas card. I don't know about you but as the 'in' thing of cardmaking comes and goes I usually end of with an excess of supplies, ribbon is one of those. I use to incorporate ribbon into my design on so many cards, I tend to neglect my supply now. I do love my rustic style Christmas cards and this one is no different. I created a die cut button then glossed it over by melting multiple layers of clear embossing powder. I pulled out some raffia ribbon to sting through the button. I used simple layers for the rest of the card, the sentiment is heat embossed in black and popped up with foam tape. Supplies: White Cardstock, Designer Paper - Photo Play - Gina K Designs - Compliments of the Season, SSS - Stitched Square, ribbon. Come play along with the challenge, stop by the Merry Monday blog to take a look at all the great inspiration created by the Merry Monday Design Team. Perfect mix of papers, Nina, and I love the button you created! Reminds me of a belt buckle - so cool with the raffia!! Very nice rustic card. Love the font in the sentiment and the way you made the button and added the raffia ribbon. Thanks for a fun challenge. Lovely rustic card, Nina. I know what you mean about not using my ribbon anymore, so thanks for the challenge. Have a great week. 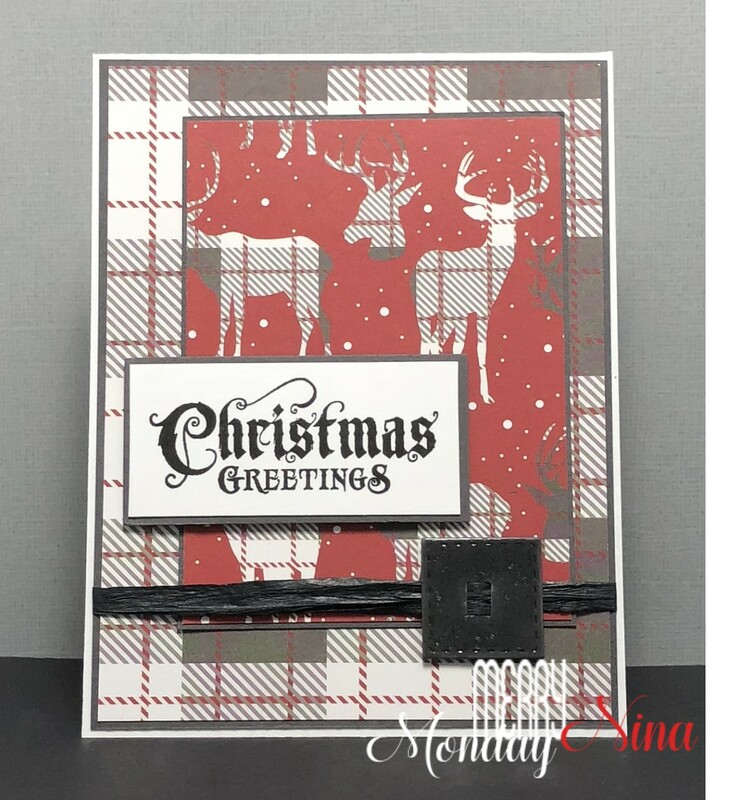 great looking rustic, masculine card...well done. Ooohhh - I am loving that paper! Super fun!